According to U.S. Census results released earlier this year, a total of 664,264 farm and ranch owners said “yes” when asked if they had historic agricultural buildings constructed before 1960. That’s about a third of all agricultural producers in the United States. ﻿﻿﻿But in California, the state’s most productive farm state, with about 90,000 farms, about 14,000 agricultural structures of historic significance were reported, compared to more than 51,000 in Texas, the nation’s Number 2 farm state. Eastern states all have double and triple the number of historic farm structures compared to Western states. Nevada, for example, only has about 500. This disparity could be explained by pointing out that the West itself is still relatively new. And, those who live and farm in the West are so busy producing crops and working with the landscape it’s hard to find time to worry about the recent past. Or maybe earthquakes, floods and wildfire reinforce the notion that nothing is permanent in the face of nature’s fury so why bother preserving what could be gone tomorrow. 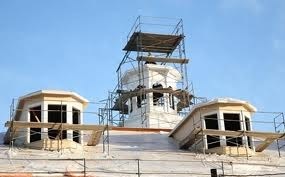 ﻿﻿﻿ Whatever the reason for limited interest in historic preservation in the West, there are some exciting restorations going on. Last November, Peter Mondavi Jr., proprietor of Charles Krug Winery in the Napa Valley, accepted the Governor’s Historic Preservation Award for 2010. The honor was bestowed by former Gov. Arnold Schwarzenegger and California’s Office of Historic Preservation for restorations of two landmark buildings at his family’s winery in St. Helena in the Napa Valley. The Peter Mondavi Family was commended for their restoration of Charles Krug’s 1872 Redwood Cellar and 1881 Carriage House. Charles Krug is Napa Valley’s oldest winery, founded in 1861, and the two historic structures represent the birthplace of the Napa Valley wine industry. The Redwood Cellar remains a working winery as it was in Charles Krug’s day, and the Carriage House is now a popular venue for special events. 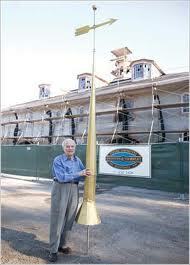 Both buildings are registered at the National Register of Historic Places and the California Historic Landmarks. The Governor’s Historic Preservation Award honors outstanding achievements in the field of historic preservation of California’s cultural heritage. 11 awards were bestowed at the Leland Stanford Mansion in Sacramento, a ceremony hosted by Milford Wayne Donaldson, State Historic Preservation Officer, and Ruth Coleman, Director of California State Parks. ﻿﻿ One of the historical challenges of the Charles Krug restorations was sourcing stone to repair the pink rhyolite that vintner Charles Krug used in the original foundation, finding trim for 80 windows, plus every doorway, arch, base and corner of the two buildings. During the renovations, which took close to two years to complete, the Redwood Cellar’s soaring stone walls and cathedral-like atmosphere were preserved and, in the Carriage House, finely hewn redwood planks from the winery’s heirloom wine tanks were salvaged and refitted to beautiful effect. Heritage olive trees located near the buildings, believed to be almost 150 years old and likely planted by Charles Krug himself, were also carefully preserved during the construction, and replanted near the winery’s front entrance. The Peter Mondavi Family’s restoration project at Charles Krug is part of a complete recasting of this esteemed Napa Valley winery. Charles Krug’s storied 150-year history traces the transformation of the Napa Valley from “Wild West” to Wine Country destination. With a legacy of nearly 70 years at Charles Krug, the Peter Mondavi Sr. Family is dedicated to ecological stewardship in order to preserve the land for their children and future generations. Having extensively replanted its vineyards with a focus on red Bordeaux varietals, the Peter Mondavi family is now practicing sustainable viticulture on its 850 prime Napa Valley acres. Those efforts to steward the land and preserve the winery’s historical legacy are earning new respect for a family long identified with California wine. 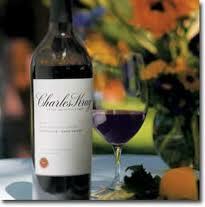 To learn more about Charles Krug Winery, where something is always going on, visit http://www.charleskrug.com/. The first winery in the Napa Valley was founded in 1861 by Charles Krug. The 27-year old Prussian immigrant arrived in America with little besides willpower and a willingness to work hard to build the cornerstone of the first winery in the Napa Valley. He became the major local winery figure of his era, greatly influencing Napa Valley’s development as a world-renown wine producing region. 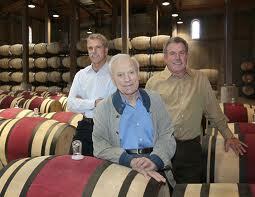 Both of Cesare Mondavi’s sons, Peter and Robert, attended Stanford University. Peter then pursued graduate studies in chemistry at University of California, Berkeley, and served in the U.S. Army during World War II before returning home to help run the winery. When Cesare died in 1959, Rosa was named president. Their sons worked at the helm of the winery operation with Robert as General Manager and Peter as Vice President. In 1966, Peter became President and Robert moved south to Oakville and began construction of his own winery. Peter’s industry innovations included revolutionary research on cold fermentation from his studies at Berkeley, enabling the production of exceptionally crisp, fruity white wines. His pioneering efforts to plant vineyards in the Carneros region with chardonnay and pinot noir grapes, cold sterile filtration techniques and aging wine in small French oak barrels contributed to his being named one of the twelve Living Legends in Napa Valley’s history by the Napa Valley Vintners Association. Since the early 1980’s, Peter’s two sons, Marc and Peter Jr., educated at UC Davis and Stanford respectively, have assumed major roles at Charles Krug Winery. Both Marc and Peter Jr. are active in all aspects of viticulture, winemaking and marketing. Peter Mondavi Sr. remains active in the day-to-day winery operation although he is increasingly relying on the next generation to determine the winery’s vision. Today, the majority of their 850 acres of Napa Valley vineyard land have been replanted, sustainable farming methods are now employed in the vineyards and state-of-the-art winemaking equipment is in place at the winery. 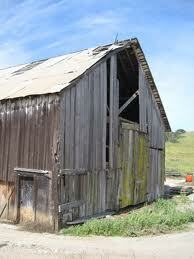 The National Trust for Historic Preservation’s BARN AGAIN! Program helps farmers and ranchers find ways to maintain and use historic barns and agricultural buildings as part of modern agricultural production. Created and managed in partnership with Successful Farming magazine, the BARN AGAIN! Program offers publications on technical issues, organizes educational workshops and recognizes good stewardship through an annual Awards Program.